Way back in 2013 I came across this post from Rebecca Alber at Edutopia, "Say What? 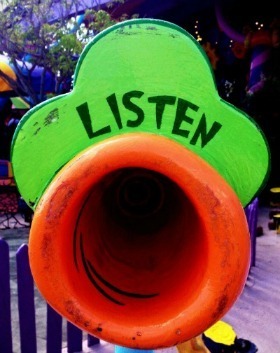 5 Ways to Get Students to Listen." And I've been thinking about it ever since. I've been thinking about it so much that I had to find it again to see if it really is as emblematic of the unfortunate dynamics between teachers and students as I remembered. Not that the advice isn't potentially useful. My criticism is not with the essay or author or necessarily with the advice, but with the context that requires this advice, a context in which young people have to be manipulated into engaging with us and our content, because if they had the choice, many would choose something else. So I've written my own version. My suggestions are most easily applied in settings where both teachers and students have considerable autonomy, but I hope these ideas may be useful to teachers even in traditional settings. Working with teenagers can be a joy. Follow these five easy steps. 1. Say something that feels relevant to your students. If you work in a typical school, as the vast number of teachers do, you most likely have to spend some time, or perhaps a lot of time, trying to teach things that do not feel relevant to your students. Unfortunately that may be your job and your mandate. That's a tough situation. Hopefully at least some of the time you get to talk about things that do feel relevant to your students, in which case you know what I mean. That's when the engagement happens, and that's when we all learn. 2. Become a listener yourself. Offer dialogue, not just assignments or lectures. This, I believe, is an option in any setting. Relationships are a two way street. Listeners beget listeners. Hopefully you get to have some autonomy on how you run your class and hopefully you have time to build relationships through listening. 3. Collaborate rather than dictate. This builds from listening. A shared vision is fun, while an assigned, irrelevant project is unpleasant. Many teachers are masterful in their ability to make the standard curriculum feel collaborative, and I salute you. I know that is a mountain of work, and that it's effective. Someday I hope we all have the freedom and support to make space for collaboration. 4. Acknowledge that not everyone cares about what you have to say at any given moment. Respect their right to not listen. This can be a really hard one in a setting where students have to care, or pretend to care, or face failure and ruin. This is too bad, of course. Having better things to think about is a sign of independence, critical thinking, and creativity. Those are great skills and qualities. It's more than unfortunate that students are shamed and punished for refusing to pretend to care when they don't. Some teachers are able to make space for that choice in a way that is respectful and collaborative. I love those teachers, and so do their students. 5. Non compulsion. Fill the room with people who choose to be there. A luxury item, I know, at least in most schools. For any ballet class or piano lesson or sports practice, people who do not want to be there are encouraged to do something else, because they are unteachable. No one wants to work with someone who doesn't want to be there, and someone who doesn't want to be there doesn't want to be worked with. In everything that is voluntary, this is obvious. But school is not voluntary, or doesn't feel voluntary to most people, at least, and so we insist on inflicting information on people who don't want to be there, at least some of the time. Not only is it ineffective in terms of learning, it's actually detrimental. When I insist that you swallow what I'm feeding you, right now, on my terms and on my timeline, not only are you extremely unlikely to learn whatever I'm trying to teach, you are likely to "learn" that your thoughts, opinions, and autonomy are wrong and don't matter. You learn that your job is to submit. Whatever information we're trying to share can always be learned later. But learning that your autonomy and opinions don't matter is very hard to unlearn. No one goes into teaching to teach submission, of course. Yet we teachers sometimes find ourselves forced to inflict this lesson, "for their own good.," and because it's our job, and because we were good students and learned submission, too. The five steps that Edutopia offered are probably more helpful in getting through your regular teaching day than anything I have to say. But I wish you could all have teaching days that were about curiosity, and engagement, and collaboration, and choice, where my suggestions could be more useful. I believe that our students wish that, too. Catherine Gobron is Co-Director for LightHouse Personalized Education for Teens in Holyoke, Massachusetts.